Intuitive – Spontaneous Creativity offers a wonderful opportunity to release your need of control, go deep beneath the layers of your daily existence, and respond spontaneously to always changing events. 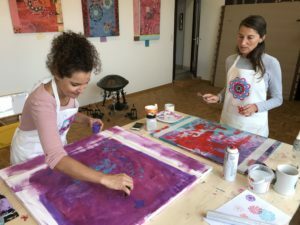 In this way, intuitive painting allows us to experience and discover ourselves through colors, shapes and forms. It is about honoring what is coming spontaneously into your mind; it is about trusting your heart and doing what feels genuinely interesting along the way. We are going to play with colors. Why not give it a try? Why not pick up a brush and see where it leads you? Why not try to listen to what the craves of your soul are? It is all about what is happening inside when you paint. My techniques and exercises are geared to help people reclaim or expand their sense of exploration, wonder, and fun. Great artists have always been extremely playful in their work. 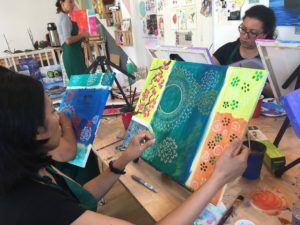 The Intuitive – Spontaneous Creativity Workshop emphasized the importance of fun and playfulness in any creative endeavor. 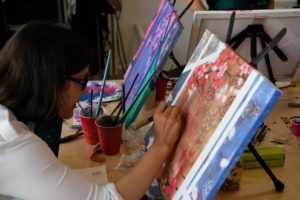 – What is creative living? – Dance, play, wonder, observe, explore. In this journey, you may confront some beliefs preventing true freedom, just as the need for a specific result, the fear of being unable, not knowing what to do, perfection, etc. It is by going through these beliefs that one transcends them. For meals and accommodations nearby there are two options within walking distance.